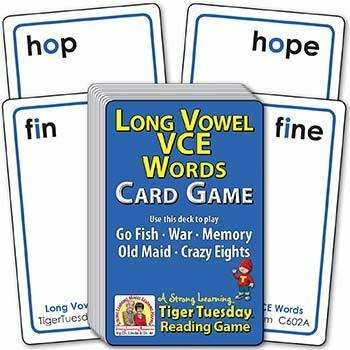 Players learn Long Vowel VCE (Vowel Consonant Silent-E) Words, essential to reading, while playing popular card games. For this deck, matches are Vowel-Consonant words and the same words with a “Magic-E,” e.g. hop and hope, cap and cape. Contents: 51 standard size cards, 3.5 x 2.25 in. (includes 46 playing cards, directions card, rule card, word list card and Old Maid card).